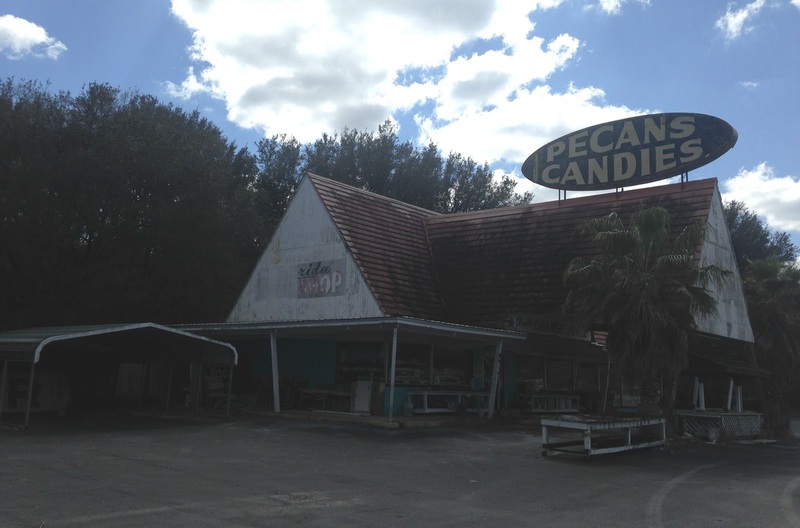 This abandoned and crumbling souvenir stand/restaurant was perhaps the most interesting structure I encountered during my drive to Florida earlier this year to visit my dad. It's located on U.S. Highway 301 near Lawtey, Florida, on the left-hand side of the road if you're traveling south. I stopped to take a bunch of pictures when I saw it. 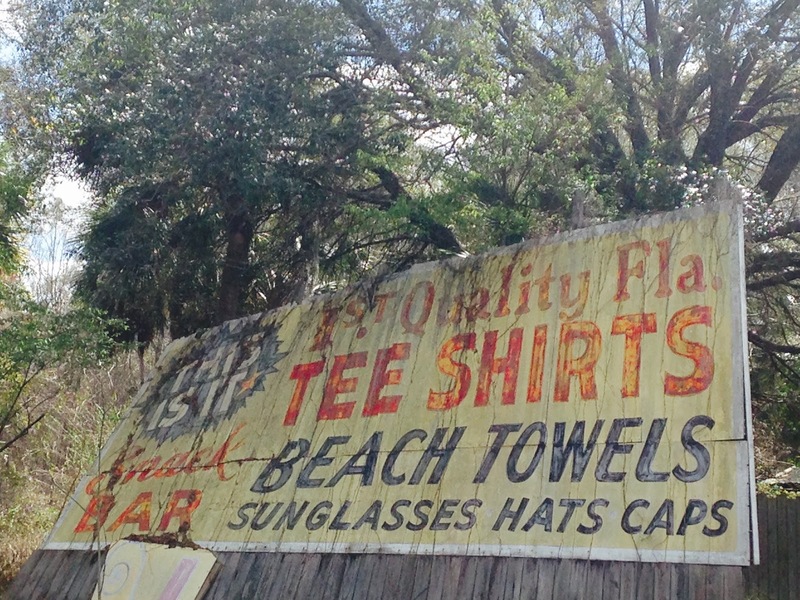 "The small town of Lawtey owes its existence to the dreams of 30 Chicagoans who in 1877, came south to find a better life under the warm Florida sun. Captain Thomas Burrin had established a sawmill on 18,000 acres. Burrin donated 220 acres of land for a town and to sell additional acres for $5.00 an apiece. The name Lawtey was the son-in-law of one of the new residents. ... The early 1900's saw the introduction of a violent element to Lawtey, and shooting scrapes became common. Those residents who dared venture out after dark often took along company in the form of a gun. Rival gangs vied for power in Lawtey, and murders were frequent. The town economically never recovered from the depression." To be clear, though, Lawtey isn't a ghost town. It has a population of about 700 and has been well-known in recent times for using a speed trap on U.S. 301 as a source of local revenue. I stopped at a tiny grocery/antiques store called Griffis Grocery (pictured at right) and purchased a bottle of soda and a pair of early 20th century postcards from a sweet old woman who told me she was legally blind. But it was the dilapidated souvenir stand that intrigued me the most. A few websites have delved into history of this business. In a nutshell, the building was constructed in the early 1960s, was home to a Horne's restaurant for part of its existence (until the early 1980s), transformed into a place called Souvenir Land, and has been closed and cordoned off for at least a few years. The main building is still filled with merchandise (and plenty of unsavory critters, for sure). A 2001 article in The Florida Times-Union states that a man named Gene Eunice had, to that point, owned Souvenir Land for 18 years and had kept a live gator penned up in front of the place for 17 years. In addition to all the standard fare, Eunice's business also sold T-shirts emblazoned with "The Silver Bullet," highlighting the man behind Lawtey's notorious speed trap —longtime Sheriff Millard M. Jordan. Blink, and you’re in the 1960s. It’s a former Horne's turned roadside stand, recalling a misty past of orange-scented perfume balls, pecan logs and wind chimes made of strings of tiny sea shells. Blink again. It’s real. For more than 25 years, Florida Souvenir Land has been a landmark along this stretch of highway north of Lawtey, where a steady string of places like this tempted tourists coming down from the Georgia border, what with the “Rest Rooms Inside” sign, bags of fresh pecans and miniature license plates with your kids’ names on them. The gal running the shop, who demurred to give her name, pulled out a photo of Florida Reptile Land and compared her memories with mine. “It had a zoo in the back, and you’d walk around a great big circle and come out through the juice bar where you gave donations if you wanted to donate,” she says. When she recalled the piano playing chicken, I just had to laugh. “They had a little square cage, right here by the side where you went into the zoo,” she recalled. “Drop a quarter in, and the chicken would peck out a tune on a miniature piano." So, getting back on point, here's my collection of photographs of Horne's/Souvenir Land and its signage, all taken on March 7, 2016. Most of these pictures were given Instagram filters, which doesn't help the "historical record" side of things, but pleases my "artsy photographer" side. And here's a photo looking back at it from the south. A life-sized owl statue was positioned on one of the wooden posts, almost as if to guard the place. It's nearly five months since I took these photos. I wonder if Mr. Owl is still there. I love all these photos, but especially the owl, which reminds me of our famous Auction Owl Antique Store Item. 1955 stamp: "Atoms for Peace"
Nice inscription inside "A New England Boyhood"
1911 postcard: "Wish we were playmates again"